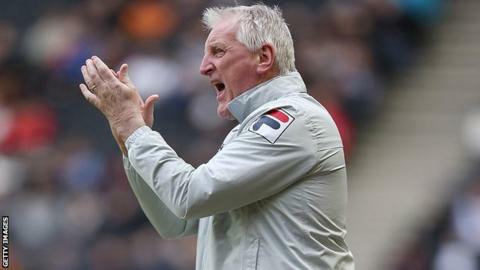 Tranmere boss Ronnie Moore has admitted a Football Association charge regarding multiple breaches of rules relating to betting on games. The 61-year-old has requested a personal hearing, a date for which is yet to be set. Moore was suspended by the League One club and replaced by assistant John McMahon on 17 February after the FA began an investigation. Rovers are 19th but only outside the relegation zone on goal difference. Moore's breach relates to Rule E8(b) of the FA's regulations. This states that any participant in football "shall not bet, either directly or indirectly, or instruct, permit, cause or enable any person to bet on the result, progress or conduct of a match or competition in which the participant is participating, or has participated in that season; or in which the participant has any influence, either direct or indirect." Moore became manager of Rovers for a second time in 2012 following spells at Oldham, Southport and Rotherham.